Mild cheddar has a smooth, creamy flavor and consistency. Kids love it! A step up from American slices, it's the starting point for a lifetime of great cheeses. Best cheese for lactose intolerant kids! This cheese has allowed our daughter, who is lactose intolerant, to enjoy all of her favorites again. We use it for pizza, grilled cheese, casseroles, mac 'n cheese, and even to make queso. The whole family loves it and prefers it to cheeses bought at our local grocery store. 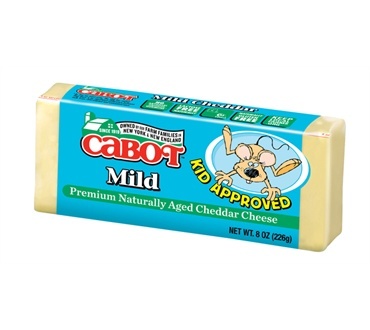 Cabot is the only lactose free cheese I will ever buy, and the mild is perfect for kids. This product is the best. I was looking for a lactose free cheese for my daughter who has Crohn's as the cheese substitutes have soy and she is allergic to soy. This product allows us to still have pizza, grilled cheese and other favorites. This cheddar is so mild, I can use it as a lactose-free substitute for mozarella in homemade pizza. Thanks, Cabot! My daughter enjoyed being able to eat cheese again after realizing she was lactose intolerant. Great tasting cheese too!